Five applications of our premium fertilizer and weed control product for the entire season. This program will maximize the full potential of your lawn by providing the most nutrition possible for healthy turf and recovery while eliminating all the weeds. We recommend this program to new customers, and those needing drastic improvements to their lawn, or the greenest yard on the block. Guaranteed results and you can save 10% by pre-paying for this program! Just like our gold program above, minus one application. This program is for those who are looking to maintain their excellent lawn, or those lucky enough to have better soil. This program still has our excellent weed control guarantee and you can save 6% by pre-paying for the season. Make your lawn program even better with Aeration and/or lawn Insect control at a discounted rate! Aeration (or coring) – It’s the secret to a nice lawn. Aerated lawns have less compacted soil and are 25% more efficient with water usage and fertilizer uptake. We recommend that your lawn be aerated once per year to help eliminate dry spots and promote plant health. Lawn insecticide application – Helena has sod web worms, chinch bugs, and ants that can harm your lawn. In some cases, these insects will cause brown spots and, if left untreated, may cause major harm. Our product is guaranteed, and one application will last all year*. Enjoy your lawn this year without being bugged. Maybe you aren’t looking for the greenest lawn on the block and only want a few applications. We offer just one application, or you can get two or three. One application will do serious damage to your weeds and help feed your lawn, but the weeds will come back and the lawn needs to be fed more than just once a year. At a bare minimum, we recommend doing a spring and fall application – but three or four applications throughout the year will provide much better results. Lawns typically require four to five feedings per season for optimum color and density. Depending on weed populations, two or three of those applications may contain weed control. (Organic only programs excluded) Nice looking lawns don’t just occur by themselves. A nice lawn is dense and able to repair itself with continual mowing. We ask a lot from our grass to handle such abuse and, in turn, it requires continual feeding. Our mowing technicians are absolute perfectionists. Our state of the art cutting machines deliver that perfect cut, and we utilize edging machines on every service for those crisp clean lines along sidewalks, curbs, and borders. We handle all the clippings, leaves, and debris with powerful blowers and vacuums. The attention to detail is eye catching, and you'll certainly be amazed by our service. The purpose of an outdoor green space is to relax and enjoy yourself. 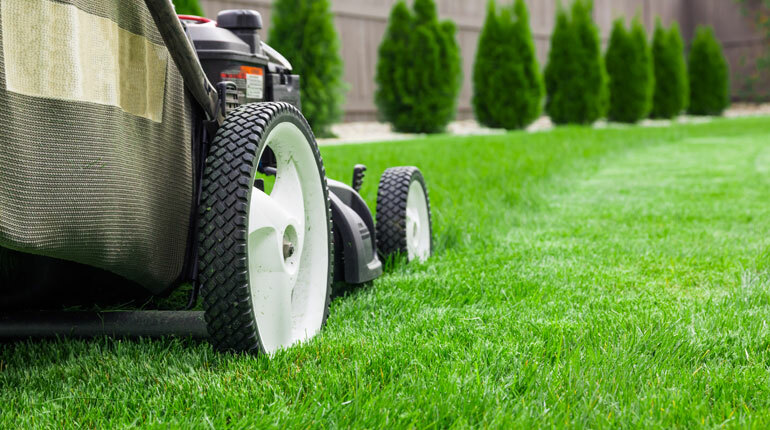 Our mowing service will allow you the time to do just that. The benefits of a well aerated soil cannot be expressed enough! A good gardener would never overlook the importance of a more loamy and airified soil for plant performance. A lawn is no different, except the process of tilling is replaced with small cored out holes that do not disturb the use of your lawn. Many sports field and golf course managers will aerate up to five times a year, which proves you simply cannot put too many holes in your lawn. For residential yards, we recommend at least one or two aerations each year. Considering sod or hydro seeding? Please read this first! Sod is hard to beat for instant results, and hydro seeding may be the only option for steep slopes. What you may not know is that a third solution exists that may be better than both. To establish new turf or renovate a scrappy lawn, we offer a perfect solution. It starts by ridding the area of any unwanted vegetation and completely airifying the soil. After the soil is prepped, we plant a premium seed that has been bred specifically to handle our hot, dry summers and long , cold winters, and thrive with less water and lower mowing heights. This seed will be covered in a layer of nutrient-rich compost, and it will soon develop into a thick “blue carpet” that your bare feet will thank you for. There is nothing more satisfying to a homeowner than a beautiful lawn canvassing your landscape and extending your enjoyable living space. If you would like to see your lawn at its best, you don’t want to miss out on this service. Compost topdressing is the process of spreading an even layer of compost over the entire lawn with specialized golf course equipment. The advantages of compost cannot be matched by anything else. You’ll notice the grass is growing thicker than what you thought possible, while requiring much less irrigation. Your water meter or pump will enjoy relaxing as this service helps pay for itself by reducing water or electricity costs. You may not be the only one enjoying your lawn! Damaging insects and even fungal disease may periodically infest your space. A telling sign may be color changes, or areas that lose color despite being watered. Please request a free checkup at the earliest sign something isn’t right. We can help you take care of the problem before it needs costly repairs.